Another day, another Apple Watch accessory. This time it's the Kosta charging coaster from Bluelounge. The Kosta is a minimalist Nightstand dock that looks a lot like something Apple would have designed for the stainless steel Apple Watch if it ever decided to make a docking accessory for the Apple Watch and Apple Watch Sport. And it even comes inside Apple-esque packaging, which is bound to make it to an Apple Store near you. Bluelounge just released it today, but we've already had plenty of time to play around with the Kosta to see if it's really worth your $15. So be sure to catch our full review down below! We had thought we reviewed the best headphone stand, which so far has been the Master & Dynamic Headphone Stand, but this might be even better. This is the Bluelounge Posto, it's the company's first take on making an accessory for headphones in the form of a minimalist and uber modern looking universal stand for on-ear and over-ear headphones that features a unique flexible headrest that self-adjusts to the arc of any headband that hangs on it. Our full review on the Posto is right around the corner! Bluelounge's newest offering is a yet another stylish organizer in the form of a cable sleeve router. The Soba, as Bluelounge calls it, is a lengthy sleeve tubing made out of a braided nylon fabric material that can expand to fit a mixture of power and data cables while auto-coiling all on its own to snuggly bind your cables into one resilient loom using a so-called Vortex technology in an attempt to rid you from that awful-looking cable clutter lurking behind or underneath your desk in arguably the most professional way possible. While not the first of its kind, the Soba is the most aesthetically pleasing cable routing solution we've seen yet. But is it also the most effective and least frustrating be-all and end-all cable management accessory? Be sure to catch our full review down below to find out! Who doesn’t love a cool little accessory to go hand in hand with your iPhone or iPod right? Well BlueLounge is at it again with their updated version of the MiniDock. Sometimes simplicity goes a long way and the brilliance of having a dock that charges your iPhone/iPod without cables is a gadget lover's best friend. This concept has worked well in the past with iOS devices made with 30-pin connectors so we imagined the new updated version featuring a Lightning connector would function just the same, if not better - it indeed it does. Having the ability to view your screen upright without looking down at the table or floor just makes life a little easier, but there are some caveats that come with such a dock having it rely on the location of your wall sockets. The MiniDock comes with a hefty price of $40, so let's jump into the review and check to see if it warrants that price tag. We like anything that Bluelounge has put out so far including the most recently released Nest stand for the iPad. This time we've got our hands on Bluelounge's latest and greatest accessory made not only for the iPad 2 it seems, but also for just about any other similarly sized tablet out there including that glossy TouchPad most of you have purchased on the cheap to use as a fancy coffee coaster, or not. Am I the only one? Enough of that though, we're here to show you the brand new Kicks. 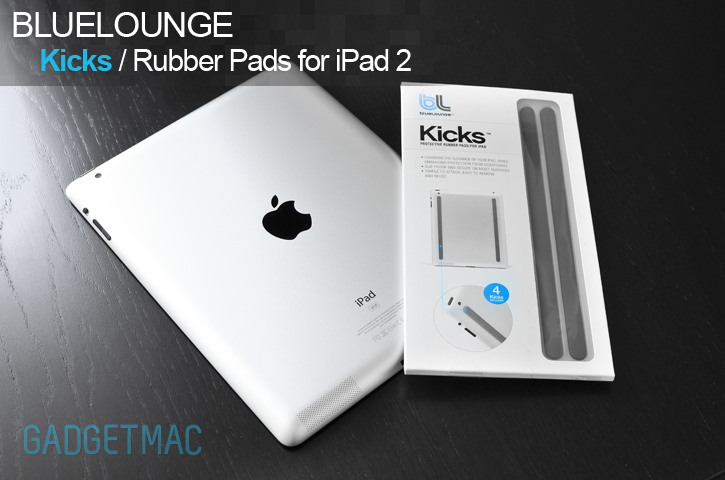 The Kicks are quite simply rubber rails you stick on the back of your iPad 2, or tablet, to add a form of protection. Bluelounge is all about modern accessories that are affordable and get the job done. The Kicks are yet another promising tablet add-on you just might actually have the need for. Catch the full review after the break!